This blog post addresses the following topics: what is femoral neck, what femoral neck osteoporosis exercises do I recommend for my patients, and what recommendations I provide my patients on how to increase femoral neck bone density. In this blog I share with you some common questions that my clients ask about the femoral neck (sometimes referred to as the neck of femur) and hip fractures. We will also cover some great exercises, that along with balance exercises and hip protectors, will help you reduce your risk of fracturing your hip. Where is the femoral neck? What osteoporosis femoral neck exercises will build femoral neck bone density? Why should you care about the femoral neck (I explain the type of bone in your body and what is susceptible to fracture). Why there is a high risk of femoral neck fracture. What movements (and specifically Yoga positions) you should modify or stop to avoid a femoral neck fracture. Can you strengthen your femoral neck if you have arthritis? Let’s start with a definition of the femoral neck and then discuss the relationship between the neck of femur and osteoporosis. From there, we identify the femoral neck osteoporosis exercises I recommend for my patients and a yoga pose that puts excess stress on the neck of femur. The femoral neck is the part of the femur that is measured when you have a bone mineral density test (DXA). This portion of your femur bone is measured because it has a larger percentage of soft bone than the rest of your femur. This makes it more vulnerable to a fracture. Falling on your hip is a common cause of a hip fracture. Improving your balance is as important as improving the strength of the muscles around your hips. You already know that exercise plays a critical role in bone health and osteoporosis. But what exercises should you do and which ones should you avoid? Many of my patients often confuse the neck of the femur with the neck pain that they erroneously associate when they have osteoporosis. These are two separate things. The neck pain you experience is not caused by your osteoporosis (other than the anxiety caused by a low Bone Mineral Density test score). I explain this in my blog dedicated to osteoporosis neck pain. 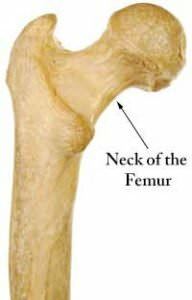 The femur is the leg bone (the thigh bone) connecting the knee joint to the pelvis. At the top of the femur is a thin piece or strip of bone that connects the long shaft of the thigh bone to the head of the femur. That thin strip of bone is femoral neck. The head of the femur is semi-dome shaped bone that rests in the hip. Why You Should Care About the Femoral Neck Fractures? Why do we care about the femoral neck fractures? There are certain parts of our body that has more soft bone, or trabecular bone. The femoral neck is one such area. Throughout our body, we have cortical bone — very hard bone — and we have the soft spongy bone. The long shaft of our femur has lots of cortical bone. It’s the type of bone that you would give your dog to chew on. Usually, it’s a cross-section of the femur of a cow. Your dog will chew on it for weeks sometimes because it’s very strong cortical bone. But, bone in the neck of femur has a very high percentage of trabecular bone — soft spongy bone. Much like bone in each vertebrae, your ribs, and your skull. These bones are at a higher risk of being fractured if you’re doing things that require or put it above and beyond what the bone strength is able to withstand. Next let’s talk about how to increase femoral neck bone density. After that we can talk about is how to protect your neck of femur when you exercise. A recent very small study in the Journal of Physical Therapy Science (6) looked specifically at whether closed kinetic chain or open kinetic chain exercises helped the neck of femur and specifically increase femoral neck bone density. I define, below, closed kinetic chain exercises and open kinetic chain exercises. The study concluded that patients should practice closed kinetic chain exercises. A closed kinetic chain exercise is an exercise where one of the supporting limbs is fixed in place. An example would be when you are doing an active exercise but keep standing and maintain contact with the floor. A squat, a lunge, or stepping and you have that foot contact to the ground — that is a closed kinetic chain. You might have been given such an open kinetic chain exercise in rehabilitation. Sometimes you see an open kinetic chain exercise in the gym where there are pads to hook your feet under and you’re asked to lift the weight. In that exercise, there’s no ground contact with the base of your feet. That is an open kinetic chain exercise versus a squat where your feet are in contact with the floor and you’re pressing up tall. 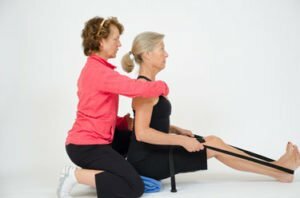 In the study, the authors conclude “Osteoporotic postmenopausal women should be prescribed closed kinetic chain exercise to diminish the effects of the disease and minimize their risk of fall.” With that, let’s look at a closed kinetic chain femoral neck osteoporosis exercise you should make part of your regular exercise program. I often recommend the squat as a femoral neck osteoporosis exercise. Let’s review proper squat form. The squat (assuming your knees are able to handle it) is probably the best femoral neck osteoporosis exercise you can do. Ideally, with time, and as you feel strong, and as your form is solidified, you want to eventually move to doing weighted squats. Some of my clients who already have spinal fractures, they’ll put weights or a weighted belt on. There are clients, with healthier spines, will use the weights on their shoulders. Your gaze and your chest are kept up. Before you even begin your squat, think about the space between your feet. Spread that space between your knees all the while that you do the squat. When you spread the space, you engage the legs so much more. With your imaginary weights, take a breath in. Tighten the pelvic floor to keep your pelvic floor safe. As you come down, spread the space between your feet. Eyes are just above the horizon. Push up firmly into the Earth. That is a squat — a femoral neck osteoporosis exercise I recommend for many of my clients. There are other great osteoporosis exercises for strengthening the neck of femur available with the Exercise for Better Bones program. Now that you know how to increase femoral neck bone density through exercise, let’s discuss how to protect your neck of femur if you have osteoporosis. For those of you who practice yoga, I highly recommend that you avoid doing the pigeon pose. In the pigeon pose, you put the neck of femur under considerable torque and then put the weight of your body on the femoral neck. This degree of stress could fracture a femoral neck with osteoporosis. Instead, you can substitute the figure four. The figure four is in Exercise for Better Bones. It uses the same type of rotation as the figure four, however, in the Exercise for Better Bones version you are lying on your back and not loading your body over a fragile femoral neck. Exercise intelligently and keep safe. If you have osteoporosis and are experiencing neck pain you should know that the two are not directly related. You might have neck pain because of the anxiety caused by your bone mineral density results but not the osteoporosis. To learn more, read my blog on osteoporosis neck pain. In the blog, I describe the neck of femur in detail and why it is at risk of fracture, how to build femoral neck bone density, and identify the best femoral neck osteoporosis exercise. I also talk about certain positions and yoga poses best avoided to protect the neck of femur and avoid fracture. In the video lecture below I discuss the relationship between femoral fractures and bisphosphonate use. Bisphospohnate use, over an extended period, can lead to increased risk of femoral fractures in older women according to a recent study published in the Journal of the American Medical Association (JAMA). Most osteoporotic fractures occur in either femoral neck fractures or intertrochanteric fractures because of the density of trabecular bone in those regions. The JAMA study looked at over 700 women who had experienced femoral shaft fractures. Fracture in this area are unusual because of the concentration of hard cortical bone in that region. The study examined these results and I explain the consequences in the video. A number of my clients with osteoporosis also have arthritis. They often wonder if they can strengthen their femoral neck if they also have arthritis. High impact loading had a positive effect on the strength of the femoral neck in as short time as 12 months. At the same time, high impact loading did not have “any harmful effect on knee cartilage composition in post-menopausal women with mild knee osteoarthritis”. However, jumping might not be an appropriate exercise for an individual with more serious joint health problems or a weak pelvic floor. In either case, you should attend to medical issues that prohibit you from jumping. Agency for Healthcare Research and Quality. Healthcare Cost and Utilization Project. www.ahrq.gov/data/hcup (Accessed on August 01, 2007). LaVelle DG. Fractures of hip. In: Campbell’s Operative Orthopaedics, 10th, Canale ST (Ed), Mosby, Philadelphia 2003. p.2873. Morrison RS, Chassin MR, Siu AL. The medical consultant’s role in caring for patients with hip fracture. Ann Intern Med 1998; 128:1010. Panula J, Pihlajamäki H, Mattila VM, et al. Mortality and cause of death in hip fracture patients aged 65 or older: a population-based study. BMC Musculoskelet Disord 2011; 12:105. LeBlanc ES, Hillier TA, Pedula KL, et al. Hip fracture and increased short-term but not long-term mortality in healthy older women. Arch Intern Med 2011; 171:1831. Multanen J., Rantalainen T., Kautiainen H., Ahola R., Jämsä T., Nieminen M.T., Lammentausta E., Häkkinen A., Kiviranta I., Heinonen A. Effect of progressive high-impact exercise on femoral neck structural strength in postmenopausal women with mild knee osteoarthritis: A 12-month RCT. Osteoporos. Int. 2017;28:1323–1333. doi: 10.1007/s00198-016-3875-1. Thank you for this informative article. I am a yoga teacher researching osteoporosis/osteopenia and I have found your books and website to be an excellent resource. I have borderline osteopenia in one hip and I’m taking steps to prevent the condition getting any worse and hopefully improve my bone density. Hi Helen, Your yoga students are lucky to have you as their teacher. So few Yoga instructors are aware of significance of modifying poses to keep their students and themselves safe. Congratulations for being proactive. Thank you for your kind words. Is the study indicating that ‘closed kinetic chain’ helps build bone? Could ‘open kinetic chain’ exercises further weaken the neck of the femur? Thanks for the exercise book and for your very informative website. I have your book for better bones, and I watched the top video, but it’s really unclear to me what you are doing with your knees and feet. The camera angle (and feet cut off) didn’t allow me to see what you did. I tried to follow what you did and ended up rolling onto the outside portion of my feet. That was the only way I could spread my knees or feet. Can you help? Thanks! 1. Does the study indicate that ‘closed kinetic chain’ exercises help build bone? 2. Could ‘open kinetic chain’ exercises further weaken femur neck bone? What does it mean to spread the space between my feet and knees during the squat? Do you mean moving the feet in some way during the squat? Thanks for the helpful advice and video! Hi Elizabeth, Good question. It is not an actual shift in your feet but rather creating the energy of spreading the space between your feet and knees. This will encourage you to keep your feet and knees in better alignment throughout your squat. 1.Yes the study did show that in Group I the group doing closed kinetic chain exercises did leg press in horizontal position (15 minutes), bicycling (15 minutes), Stairmaster climbing (10 minutes) they had a signnficant improvement in BMD in the hip. 2.No the study does not indicate that it weakened the femur neck bone but rather that the gain in the not significant. Hi Jennifer, Thanks for supporting my work through the purchase of Exercise for Better Bones. It is not an actual shift in your feet but rather creating the energy of spreading the space between your feet and knees. This will encourage you to keep your feet and knees in better alignment throughout your squat. If you find yourself rolling onto the outside of your feet, think about stretching the mat or floor beneath your feet which will reinforce keeping the base of your big toe grounded. Hope this helps. The hormone replacement therapy you talked about, you follow it every day without stopping or you follow it 21 days and you stop 7days and then continue in the same way. I have just been diagnosed with osteopenia in my left neck femur. I came across your website and find your recommendations for exercise very helpful. Is there a charge for your exercise suggestions? I am also going online Amazon to look for your books. There are no charges for exercise suggestions in the book. Margaret operates her Physical Therapy clinic in Ottawa where she treats clients with osteoporosis and, where appropriate, prescribes therapeutic osteoporosis exercise programs. If you are not close to the clinic she does, at times and when appropriate, provide phone consultation services.